Another Friday off work, and beautiful early autumn weather, which I feel like I need to take advantage of while I can. On the other hand, I am getting behind on a lot of stuff. So I decided to try a trip I could hope to finish by early afternoon. As it turns out, I got back from this one a little after 3:00 PM, which is not bad. 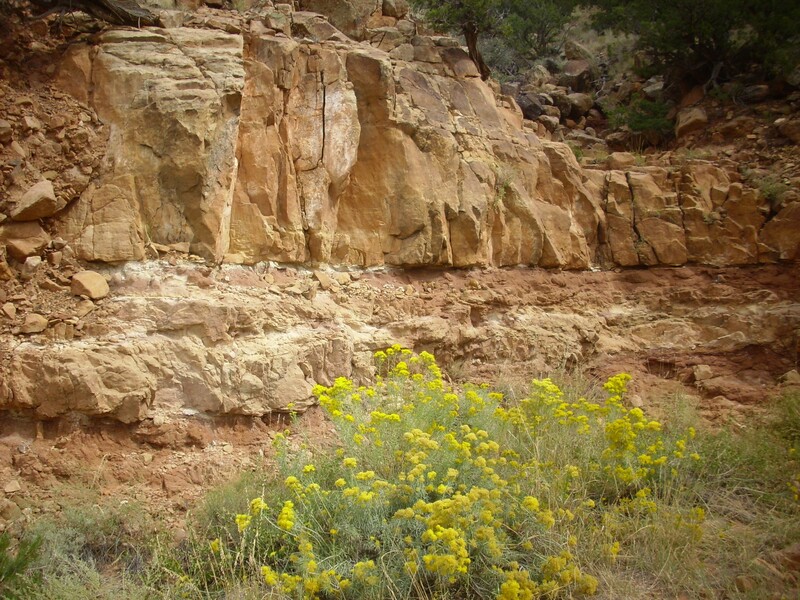 I had been trying to find an exposure of Moenkopi Formation and Glorieta Sandstone I could get at to sample. There are some beautiful exposures in Canon de Canada, judging from my geologic map and Google, but the trick is finding a way into the canyon. There is a road in from the north end, but I’ve driven part of it and even the part that looks passable on Google Satellite is pretty bad on the ground. Further down the road looks awful even on Google Satellite. I could hike in from the south end, but apparently only by cutting across private land — and I could not make myself feel good about that. 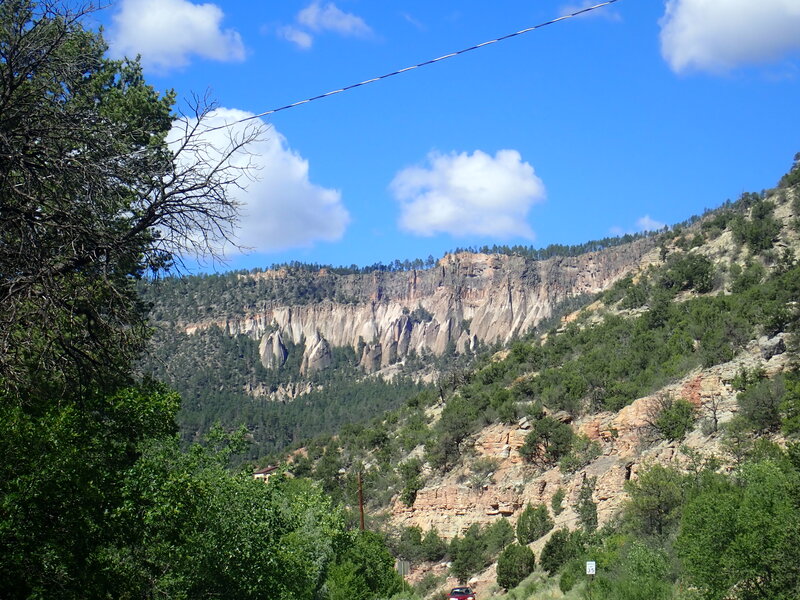 But then I found that there are beautiful exposures on the east side of lower Canon de San Diego, well within the Santa Fe National Forest boundaries, and apparently reachable by a decent-looking road off of State Road 4. The road has houses along it, at least at first, always a good sign. Ah! And I could stop by a couple of tent rock outcrops along the way, at La Cueva and northwest of Soda Dam. My route took me from White Rock west into the Jemez along State Road 4. This was all very familiar ground until I reached the turnoff into the La Cueva subdivision, just south of the main highway into the La Cueva area. The road was gravel, but this was a built up area, so I didn’t expect the road to get too bad very quickly. I drove to the start of the ten rocks and found a place to park. The La Cueva tent rocks area shows all three members of the Bandelier Tuff, starting with the La Cueva Member (known in older papers as the San Diego Canyon Ignimbrite) at the bottom, the Otowi Member in the middle, and the Tshirege Member at top. 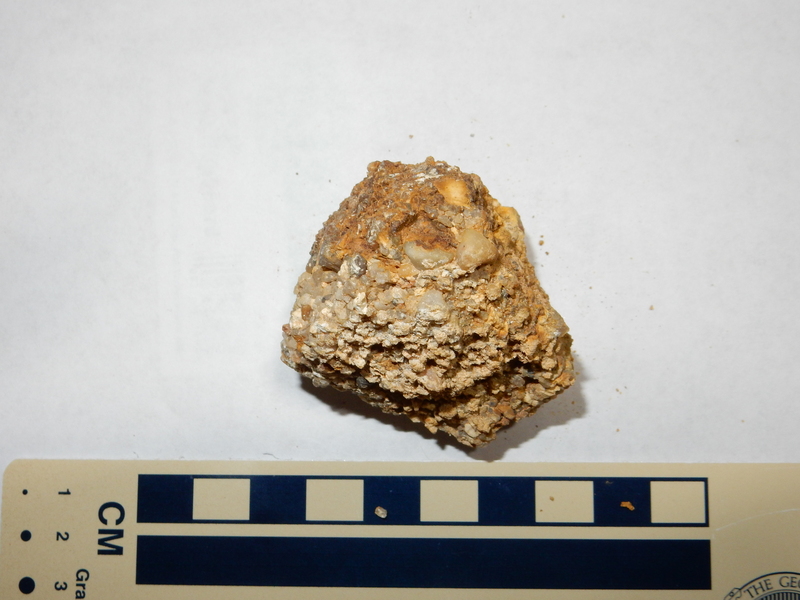 The La Cueva Member was erupted about 1.85 million years ago and seems to have been a relatively small eruption. Exposures are found only here, along the west wall of San Diego Canyon, and as a thin bed in the upper Puye Formation in one or two places north of Los Alamos. 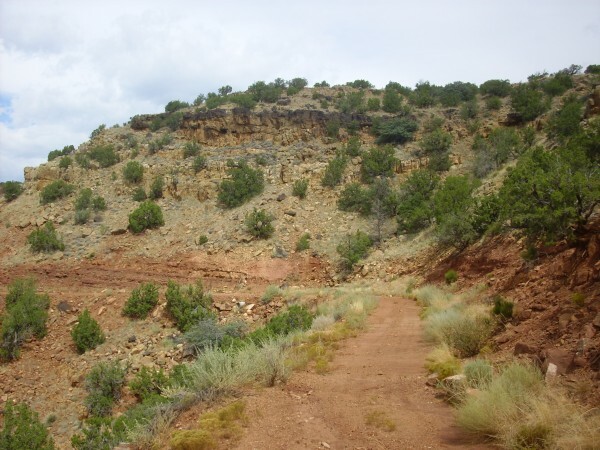 The Otowi and Tshirege Members are found all around the Jemez, with the Tshirege Member forming prominent finger mesas in the Los Alamos and White Rock areas, with the Otowi Member forming a gentler slope at the base of the mesas that is often covered with soil and rock fall. Here at the southwest caldera rim, the Tsherige Member is a relatively thin set of beds on the caldera rim with much thicker beds of the Otowi and La Cueva Members beneath, forming the tent rocks. The three formations can be difficult to tell apart, reflecting their common origin in the same magma chamber at different points in time. I walked up the road (it is suitable for passenger vehicles, with care, but hiking is a better way to take in the formations) and snapped several more pictures. This first is of a single hoodoo among the tent rocks. I’m making a somewhat fine distinction here between a tent rock and a hoodoo. Tent rocks form from erosion in dry climates of a more resistant bed underlain by a less resistant bed. The more resistant bed forms caps that protect the less resistant rock beneath, so that the combined beds erode into the tent-like structures seen here and elsewhere. 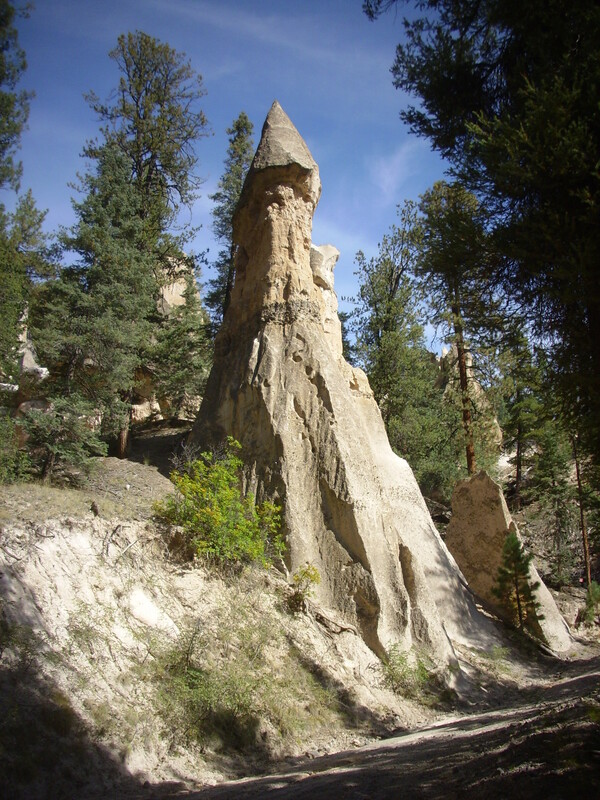 A hoodoo differs in that the protective cap is an isolated boulder of a more resistant formation. In this case, if you zoom into the upper part of the photograph, you will see a dark boulder atop one of the rock columns. 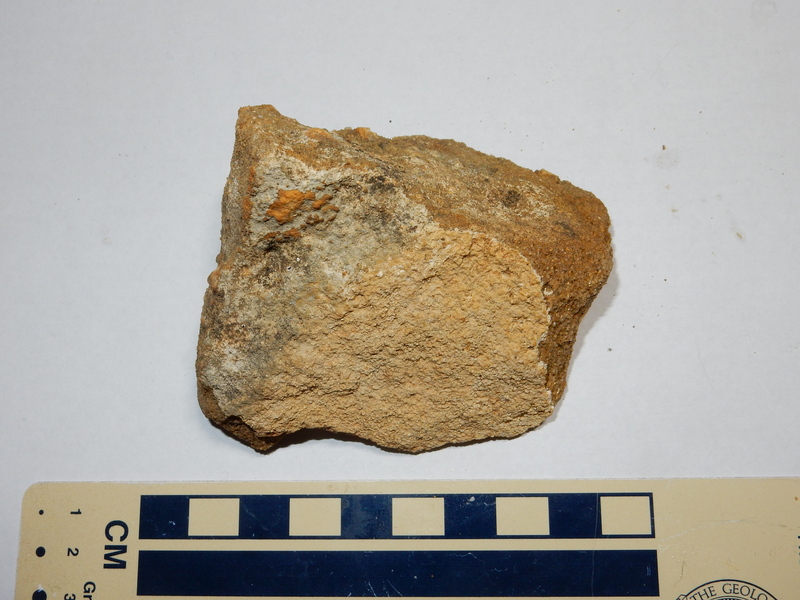 This is likely a fragment of resistant andesite of the Paliza Canyon Formation, probably emplaced during the eruption of these beds. 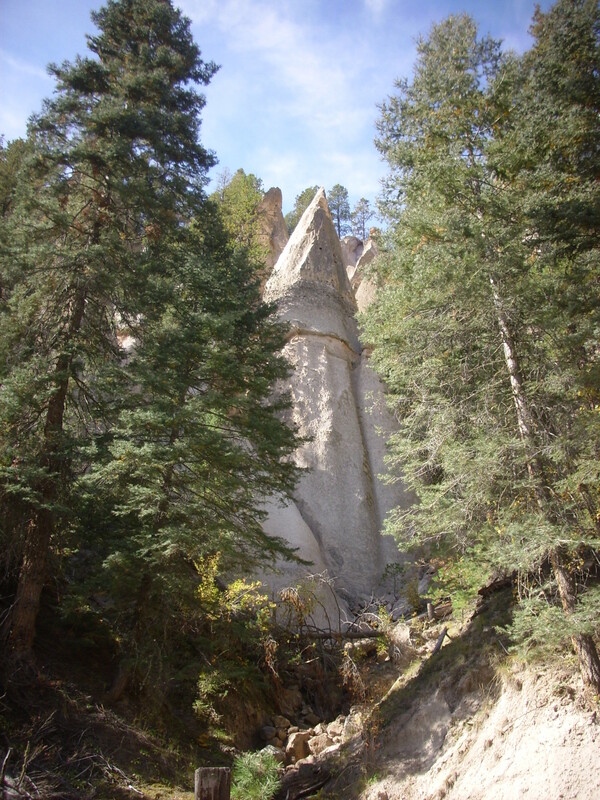 The entire area below the tent rocks is underlain by Paliza Canyon Formation visible as scattered andesite boulders. Here’s a tent rock showing some kind of contact between beds. It’s a little challenging to tell the various contacts in this area apart. The geologic map does not have nearly the detail necessary, and while I have a road log discussing this location, it has a single photograph of only the uppermost Tshirege beds and a crude diagram of this area as a whole. But I believe this is the contact between the La Cueva Member below with the Otowi Member above. This one seems to more closely match my road log’s diagram. 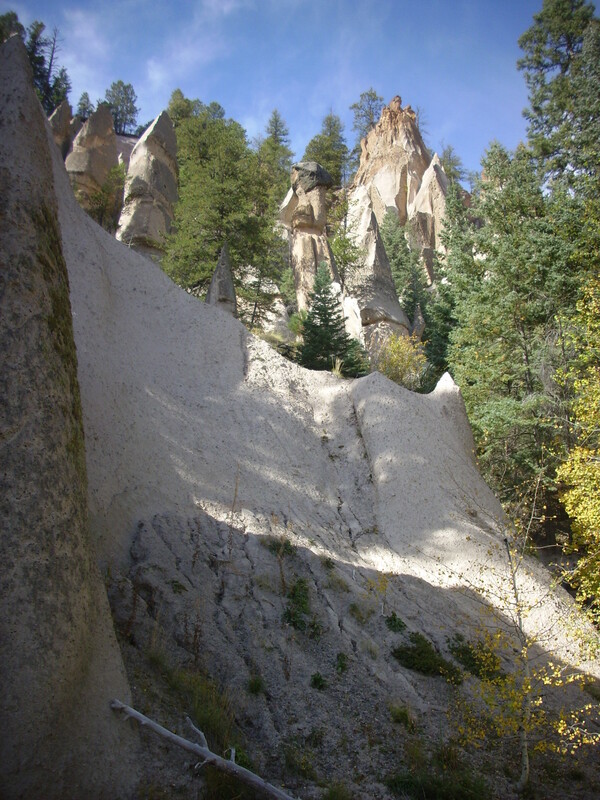 If so, the bottom of the tent rock is the “A” bed of the La Cueva Member; the lithic-rich layer halfway up (the thin layer full of dark pebbles) marks the transition to the “B” bed of hte La Cueva Member; and the cap at the very top is Otowi Member. Here’s a view of the formation from the other side. From here, the contact between the Otowi Member and the topmost Tshirege Member is visible. 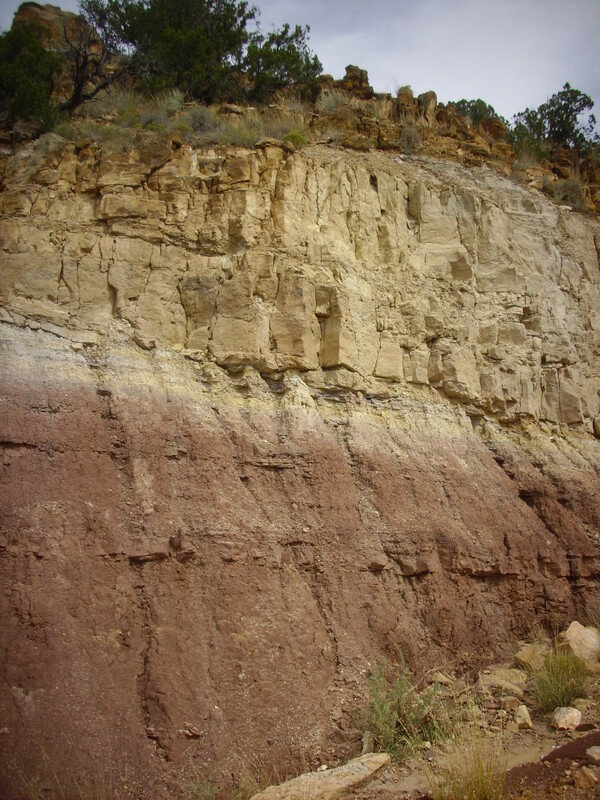 The tan band is probably Cerro Toledo interval sediments, while the bed of pumice is the Tsankawi Pumice that marks the lowest part of the Tshirege Member. I hiked back to my car, turned around (with a moment of panic when it didn’t get traction at once), and headed back to State Road 4. I headed south past Battleship Rock, stopping halfway to Soda Dam for a long distance shot of the next set of tent rocks I hoped to visit. I’m calling these the “Redondo tent rocks” for lack of a more convenient handle. They are located on the canyon wall above a subdivision whose main entrance road is Redondo Road, so the name seems appropriate. While I was stopped here, I noticed that there was a particularly fine exposure of Madera limestone to the east, and I could not resist a photograph. 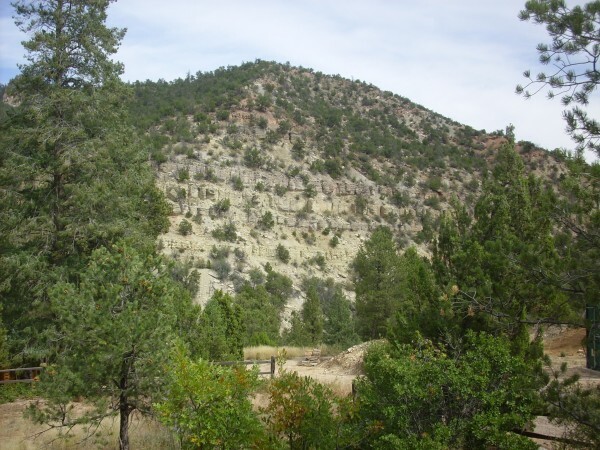 The Madera Formation has been “promoted” to group status in some recent geologic work. It is possible that this is the Guadalupe Box Formation of the Madera Group. Or it might be merely the Guadalupe Box Member of the Madera Formation, depending on how seriously you take the promotion. Or it might not be Guadalupe Box Formation/Member at all, depending on how seriously you take my ability to identify a bed of rock from half a mile away. I drove to Redondo Road and began the ascent. Since this is a subdivision, with numerous houses, the gravel road was reasonably well maintained. When I got to the top of the subdivision, I parked at a likely spot and geared up to hike. 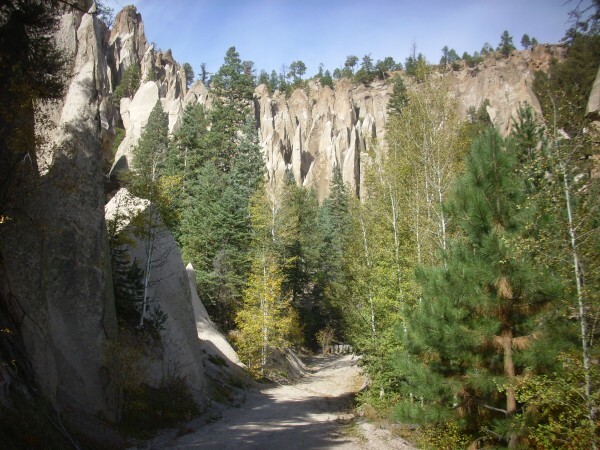 Only when I got to where I thought the forest road to the tent rocks began, I was flummoxed. There was a driveway immediately to the left with a gate with about five signs with various variations on “No Trespassing”. (And a peace flag on a pole just beyond. Go figure.) The fence immediately to the right had a single more subdued “No Trespassing” sign. The road itself had a chained gate, though the chain was down just at this moment. A short distance down the road was a “Texas Aggie Parking Only” sign. It looked like the road up to the tent rocks was now a private road, contrary to my road log. Maybe. 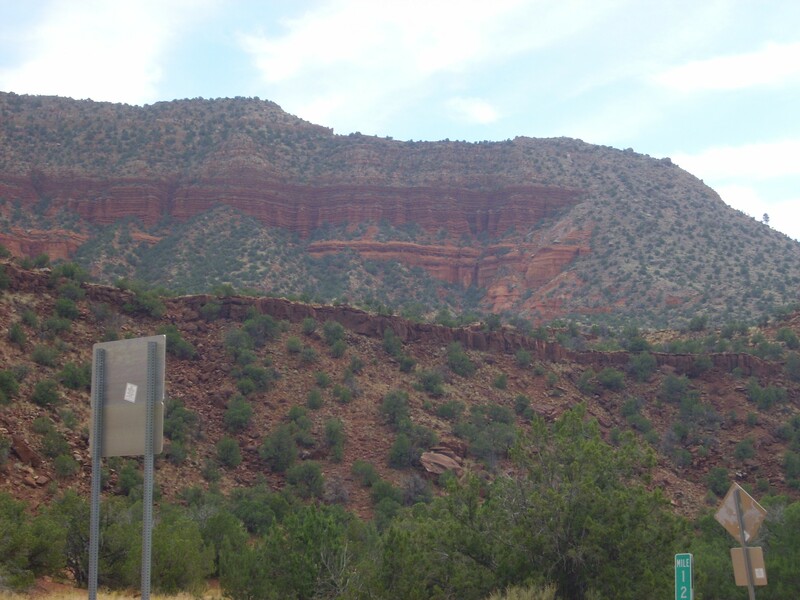 You can see the Madera Formation grading into red Abo Formation towards the top of the hill. Turned around and headed on south. I could not resist pausing for a picture of Mesa de las Casas. The foreground is Abo Formation. 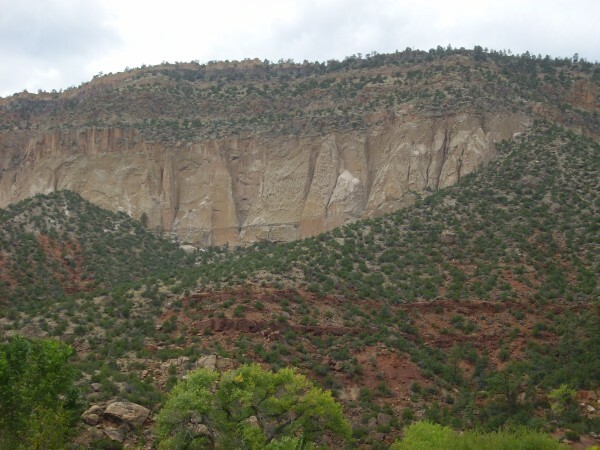 The sides of the mesa, working upwards, are Mesita Blanca Formation, Yeso Group (the thick, lighter beds at the base); San Ysidro Formation, Yeso Group (the thinner red beds above); Glorieta Sandstone (the lither beds near the mesa top); Moenkopi Formation (at the very top of the mesa and under the knoll); and knoll of Shinarump Argua Zarca Sandstone. Gonna see a lot more of these today. 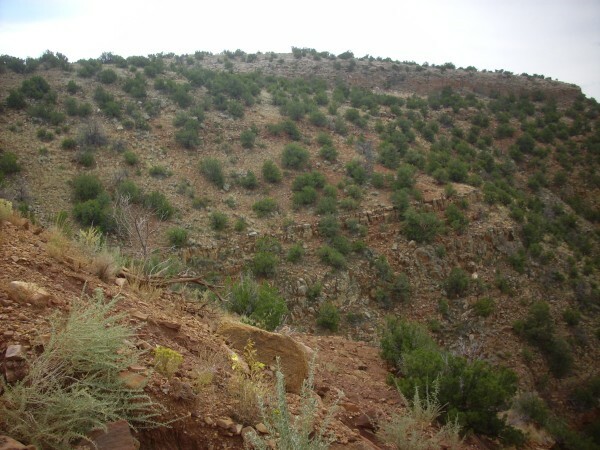 The Mesita Blanca Formation is, incidentally, sometimes correlated with the De Chelly Formation that was originally mapped in Arizona. And I’m informed that it’s pronounced “De Shay”, in case you don’t want to embarrass yourself at a cocktail party at which one of the other guests is unexpectedly an Arizona geologist. Myself, I don’t go to cocktail parties. I nearly missed the turn onto Camino Amarillo, and then my heart sank just a little: The road didn’t look so great. Well, shucks and other comments. I proceeded anyway, with considerable care, and it wasn’t too bad at first. There were houses along here, after all. But once past the houses, the road got increasingly iffy. It wasn’t so much that I couldn’t get past the occasional bad spot, with care, but one dreads what one might come across suddenly. I had a particular scary moment when I came over a rise and saw how badly gullied the road was beyond. Apparently Clownie was even more frightened, because he stalled, leaving me to try desperately negotiating the road in a passenger vehicle that had suddenly lost power brakes and steering. I made it, but I was a bit concerned whether I could make it back up the hill when the time came. This was, incidentally, the last section of road leading to anyone’s house, and a couple of gullies across the road had been filled with flagstone here. I figured it was only going to get worse from here on; and I was right. Yeah. Those two gullies looked worse from my driver’s seat than in the photo. There was a good place to pull over just before the gullies, and I did. Got out. Ate some lunch. Scrutinized the gullies; my car might be okay, but why chance it? I was now within reasonable hiking distance of my objective. Tried to turn my car around. It did not seem to get any traction. Shucks and other comments. Then a hard slap to the side of my own head: I had not taken off the parking brake. After that, it was fine, and I parked my car to the side of the road facing back the other way. Loaded up my hiking gear and began hiking. 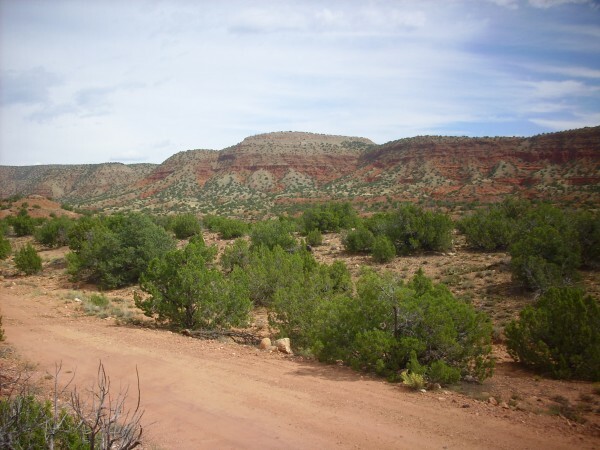 By the way, that bright red soil is eroded from Abo Formation, which was pretty much bright red soil when it was laid down 300 million years ago. Dirt stays dirt for a long time. I soon came across the approximate fault trace of a strand of the Jemez Fault that runs just west of the west face of Mesita Blanca. Here are some beds of the Abo Formation that look to have been warped by the fault. And the fault trace seems to be exposed in the road. The dark red Abo Formation beds in the foreground abruptly give way to more orange beds of the Yeso Group. Here’s a closer view of the whitish patch in the road on the other side of the fault trace. 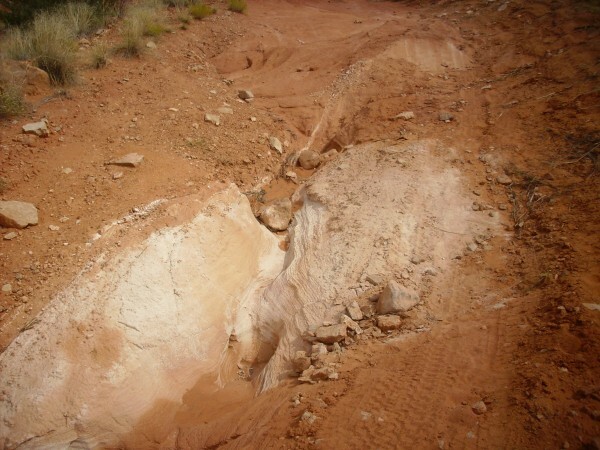 The white discoloration is likely from ground water seeping from the fault. The rock beds in the road bed are so deeply gullied that I could not possibly have brought my car any further. 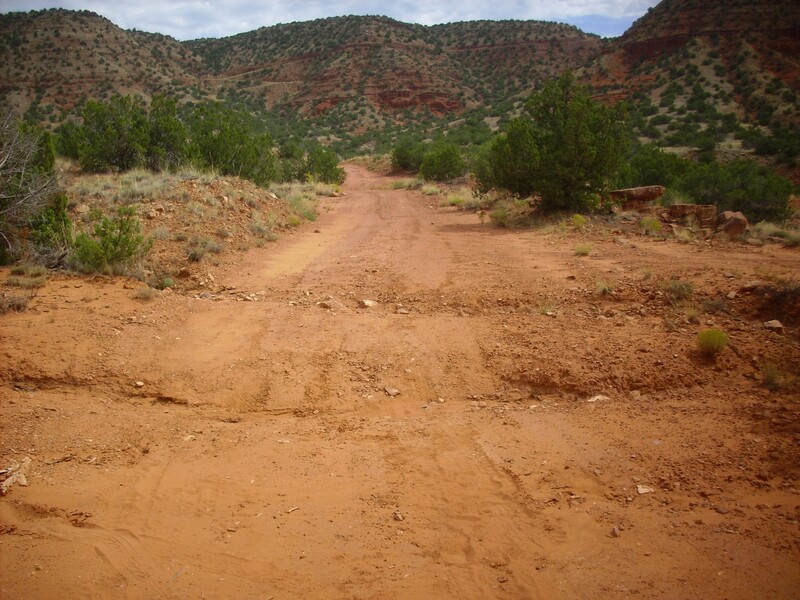 It would require great care even with an off-road vehicle, though the tire tracks show someone did so since the last rain. I passed a small unnamed mesa west of Mesita Blanca that wanted to be photographed. The vertical cliffs at the very base of the mesa, just above the talus fans, is San Ysidro Formation, Yeso Group. Above is a paler marker bed seen throughout this area, and above this bed, the San Ysidro Formation grades into Glorieta Formation making up the bulk of the mesa. 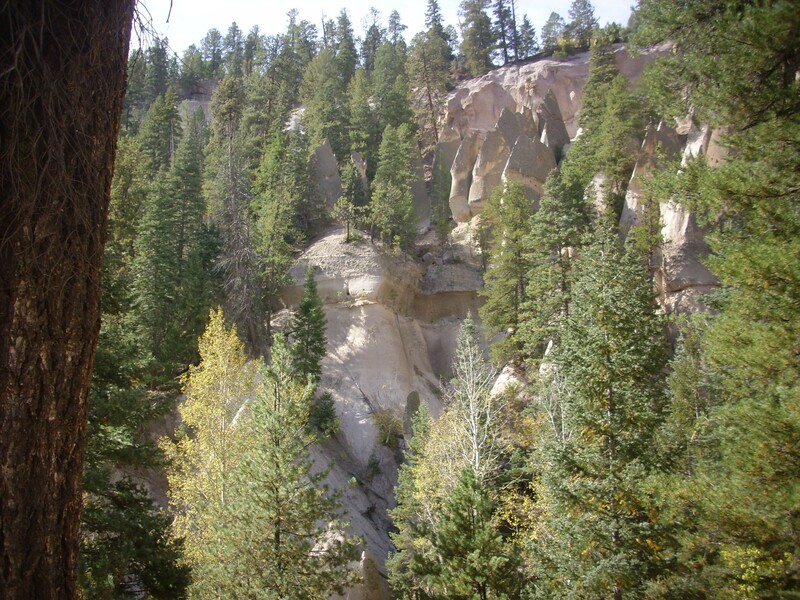 There is a small cap of Tshirege Member, Bandelier Tuff, at upper right. The road began to ascend the west face of Mesita Blanca, and here there was an iron gate welded across the road. Which seemed like an excellent idea, since the road beyond was truly dreadful. 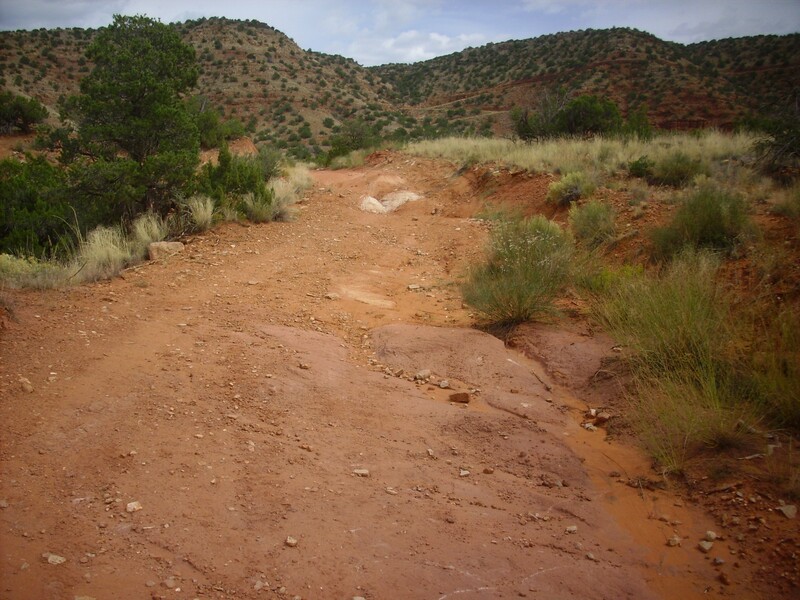 This road ascended through San Ysidro Formation red sandstone, of which I took a sample. Under the loupe, this is a well-sorted fine sandstone of rounded quartz grains, though occasional lithic grains, with abundant hematite cement. A little further up the road seemed like a good place for a panorama. 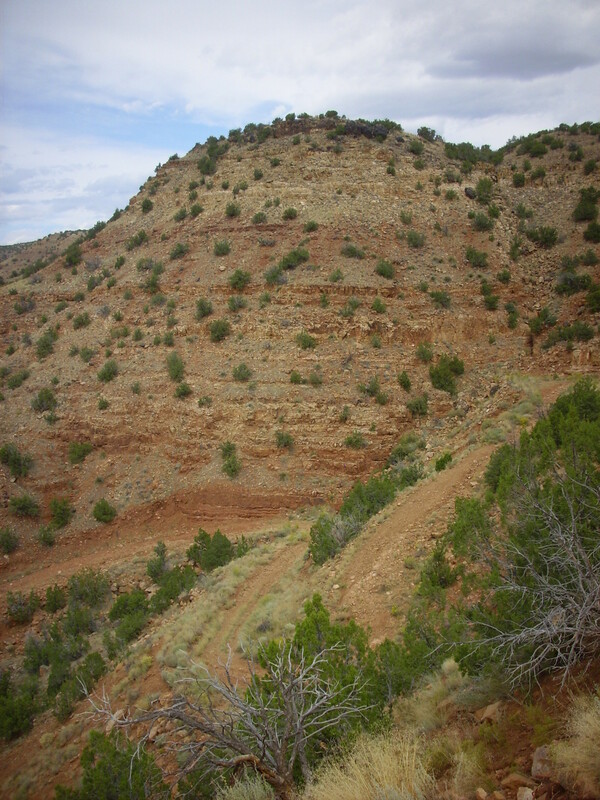 The first frame shows nearby slopes of San Ysidro Formation and Glorieta Formation, with the limestone bed approximately marking the boundary. Across the valley, the lowest red slopes are Abo Formation. 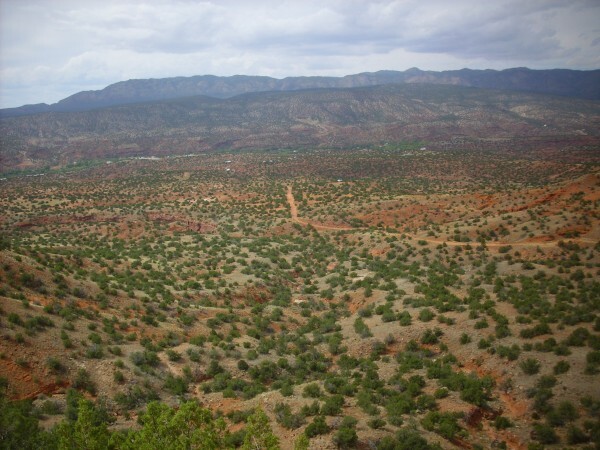 The light-colored escarpment beyond the Abo beds marks the trace of the main strand of the Jemez fault, which has thrown down the Abo beds relative to the older Madera Group limestone making up the escarpment. The Sierra Nacimiento on the skyline beyond is underlain by Precambrian gneiss, exposed by yet another fault, the Sierita Fault, that has thrown down everything to its east. The Sierita Fault marks the extreme western edge of the Rio Grande Rift Zone at this latitude; further north it merges with the Jemez Fault. The transition from the San Ysidro Formation to the Glorieta Formation is gradual, but this is a fair guess where it should be put. I hiked up a little higher before collecting my Glorieta Formation sample. 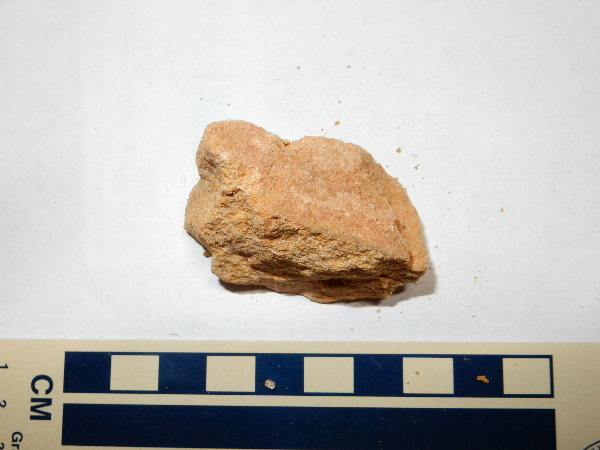 Under the loupe, this is a moderately well sorted medium sandstone of somewhat angular quartz grains with ample pore space that appears to be cemented with silica. I found myself looking back over a considerable distance to where I had parked my car. Little lonely car. Click to enlarge and squint. Notice that the fine early autumn we’ve been having is deteriorating. It rained yesterday and today. Well, bad weather gives me time to catch up on writing and organizing my rock samples. Continuing up the road, I came to the muddy beds of the Moenkopi Formation. The Moenkopi is very well exposed all along the road cut, which coincidentally dips to the north at about the same angle as the beds. The Moenkopi is thinly bedded sandstone and mudstone and tends to form slopes rather than cliffs. 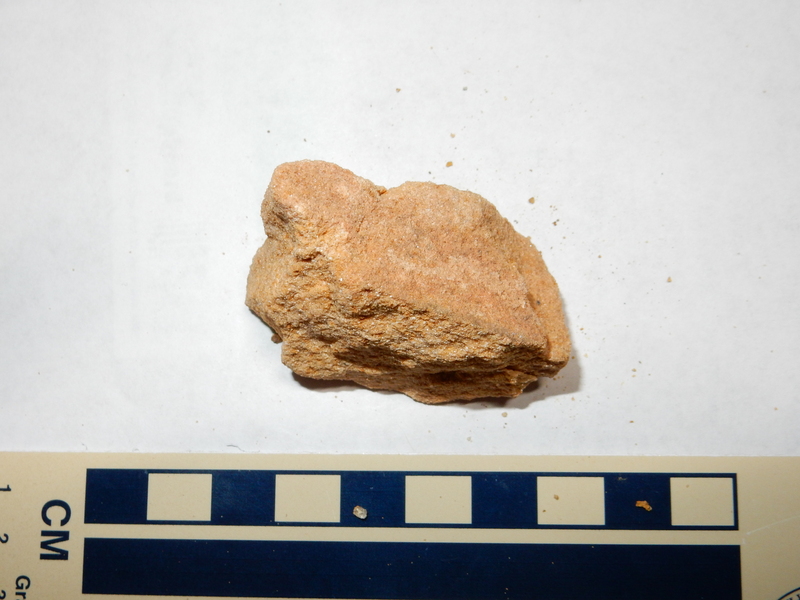 Under the loupe, the sample here is revealed as a poorly sorted coarse sandstone of well-rounded quartz and lithic grains with abundant cement filling the pore spaces — probably enough that the rock is matrix-supported rather than clast-supported. A lithic wacke. 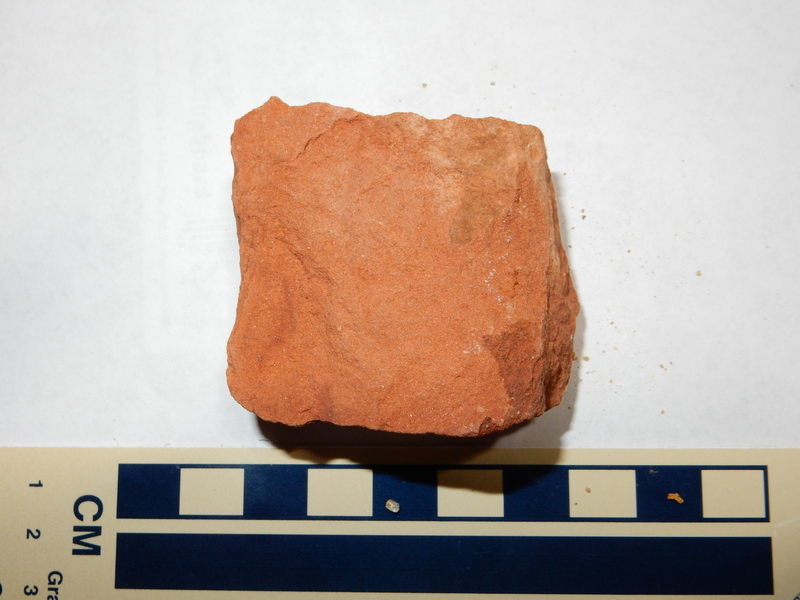 Very distinct from the underlying Glorietta Sandstone or overlying Shinarump. The Moenkopi tends to form slopes, and you can see the slope of Moenkopi above the road cut and below the base of the cliff-forming Shinarump Formation. The top bed here is a very hard ferruginous conglomerate; we’ll see more in a moment. The two formations are easier to see just a little further up the road. You may laugh at how excited geologists get about contacts. Think of it as like moving from one chapter to another of a book. Which gets me thinking of how the most avid bibliophile I know is an environmental geologist. This shows the Glorietta Sandstone forming a steep sloop at lower right. Then comes a much gentler slope of Moenkopi Formation. The slope begins to steepen again above the contact with the Shinarump, but then we run out of mesa. In the background, the ridge on the skyline is an isolated mesa of Tshirege Member, Bandelier Tuff, which has the distinction of being the furthest southwest remnant of the Bandelier Tuff that has not been eroded away in the last million years. This transition is visible even on Google Maps. The Shinarump is a quite varied formation. The lower portion is interbedded sandstone and conglomerate. 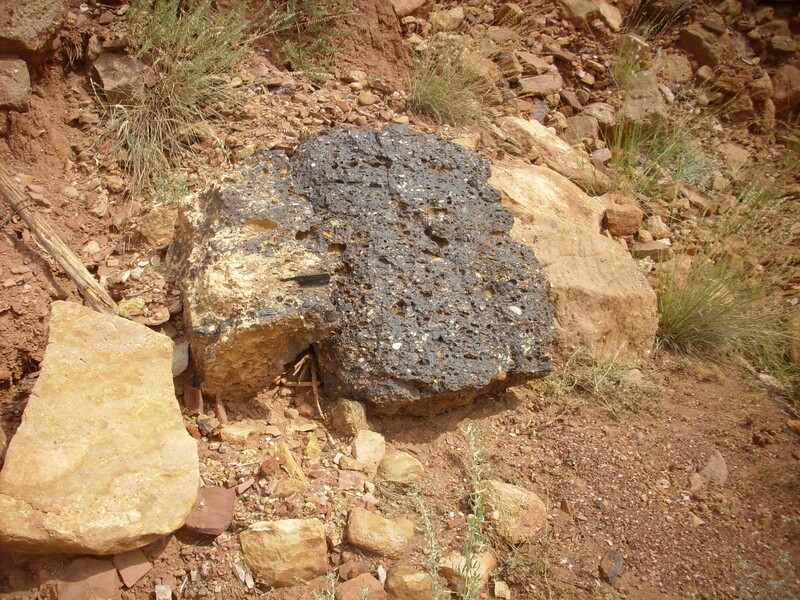 The conglomerate beds are so distinctive that the Shinarump Formation is sometimes informally described as the Shinarump Conglomerate. 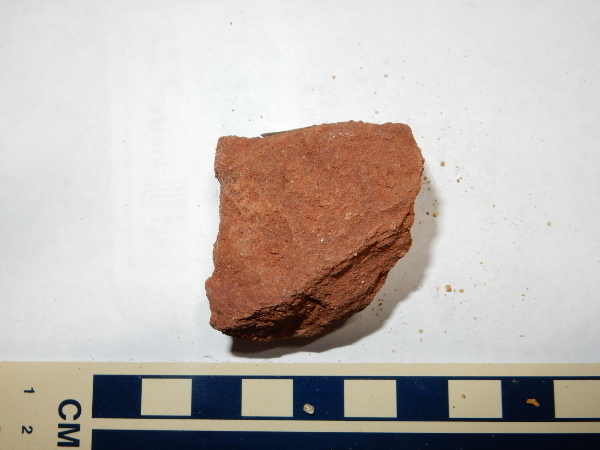 Under the loupe, this is seen to be a moderately well-sorted fine conglomerate of well-rounded quartzite pebbles cemented together with abundant tan matrix. 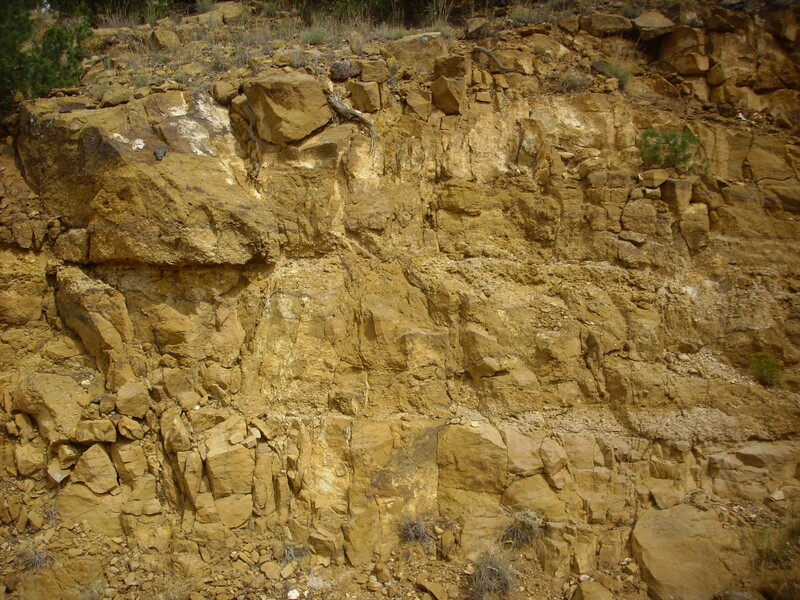 The sandstone is a well-sorted, coarse sandstone composed of angular quartz grains with a modest amount of cement. 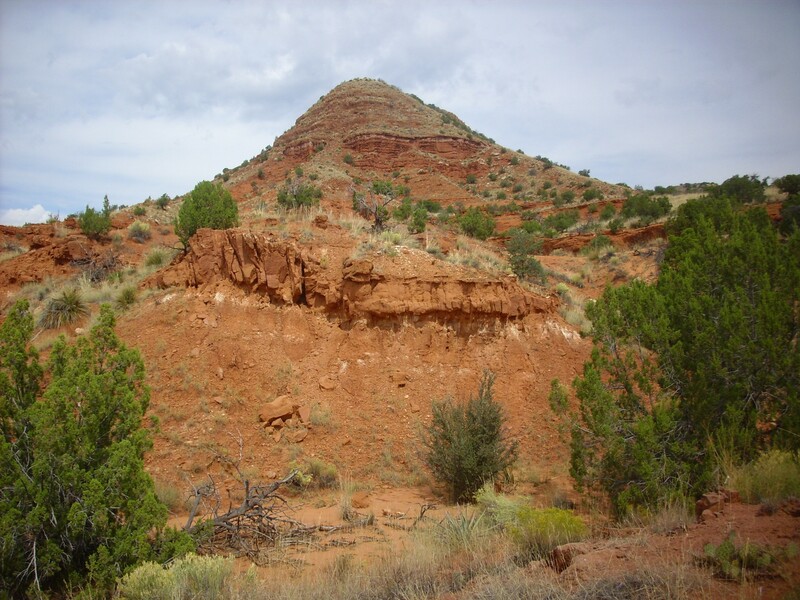 The Shinarump is the lowest formation of the Chinle Group. 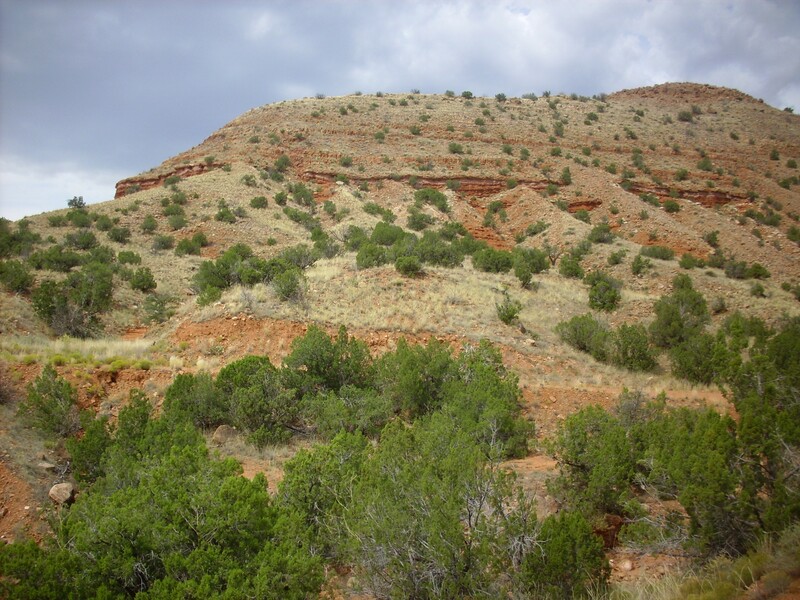 The Chinle Group is thought to have been deposited in a large river valley, comparable with the Mississippi or other major world river valleys of today. The river, which has been named the Chinle River, ran from Texas through New Mexico, Arizona, Utah, and Nevada before reaching the ocean. The river system was long-lived and deposited vast quantities of sediments in its valley and delta. The Chinle River must have passed close to the Jemez area as it threaded its way between the Uncompahgre Uplift to the north and the Pedernal Uplift to the south. Conglomerates form close to the source rock from which they are derived. The Shinarump Conglomerate is a relatively fine conglomerate composed of well-rounded pebbles, so it did not form right at the source rock, but some distance away. 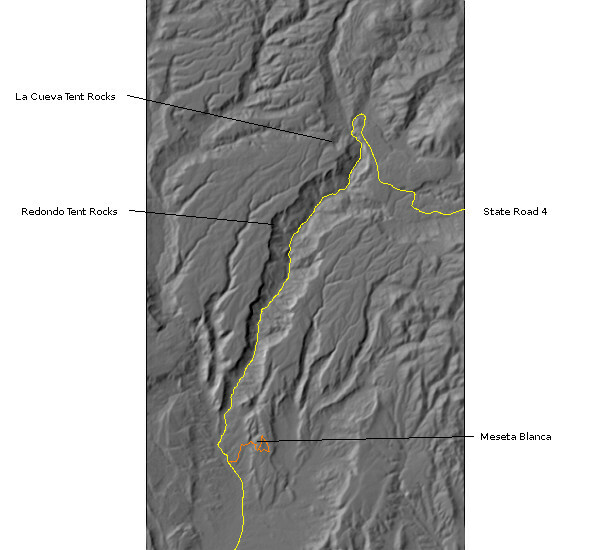 My guess is that the Shinarump formed when the Chinle River first cut through a saddle of high ground between the Uncompahgre and Pedernal Uplifts. This would have produced abundant coarse sediments close to this area. Some of the upper beds of the Shinarump are a very coarse ferruginous conglomerate. By this point, I was running out of time, plus I was a little bit tired, so I did not climb clear up to the ferruginous beds, settling for looking at boulders that had eroded off the beds. “Ferruginous”? 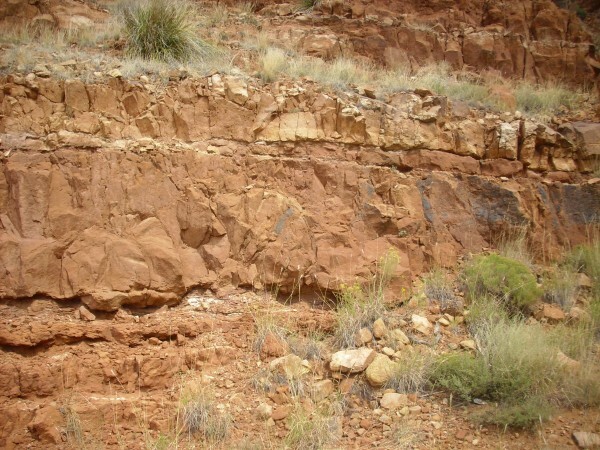 That means the matrix is very rich in iron oxides, such as would form from prolonged leaching of soil in a tropical climate. Which is what I suspect happened here. The geologic map notes that the Shinarump is usually overlain by the dark mudstones of the Salitral Formation, and these ferruginous beds sort of kind of make one think of the Salitral. Except they’re conglomerate, not mudstone. Well, I was out of time, I had seen almost everything I cared to along this road, and I was tired, so I started back. I just had to take this photograph, though, which beautifully displays the entire rock column we’ve seen here. At the bottom are the red beds of the San Ysidro Formation, Yeso Group. 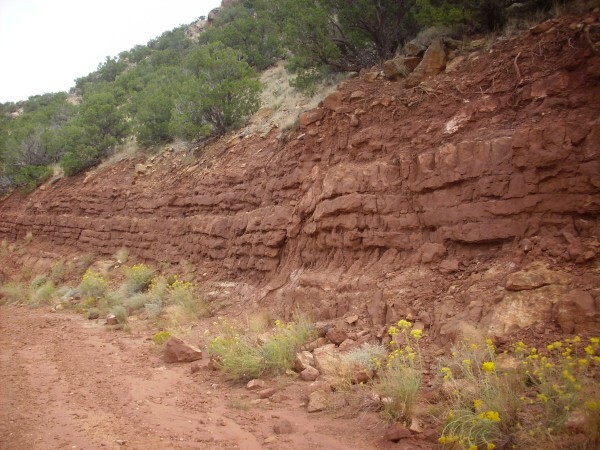 Above these are lighter beds of the Glorieta Formation. Then comes the gentler slope and darker beds of the Moenkopi Formation, and finally the steep slope and lighter beds of the Shinarump Formation, with a cap of dark ferruginous conglomerate. I hurried back down the road as best I could, conscious of the time, and worrying a bit whether I’d be able to get my car up that one hill on the road back. I found that the hill looked a lot less scary from below; perhaps I should have anticipated that. It’s true of hiking on foot, too. Still, I said a little prayer before revving up and racing up the hill, which turned out to be okay. The rest of the road back was still bumpy in spots, but since I’d now done it before, I was less nervous about doing it a second time. Which can be treacherous; I bottomed out slightly twice, once where I really shouldn’t have, where I was back in the area with houses. 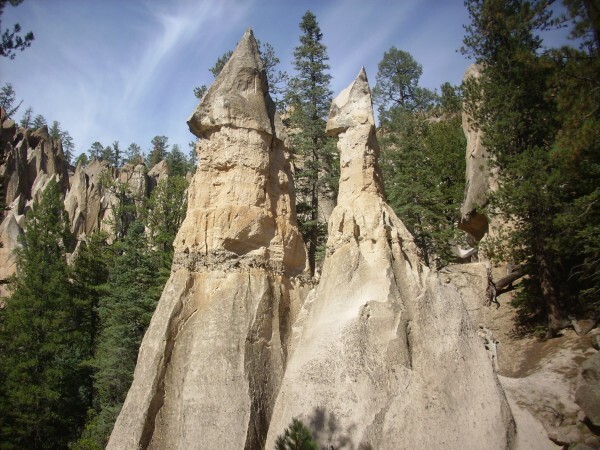 Why this is cool is because all three members of the Bandelier Formation are visible. 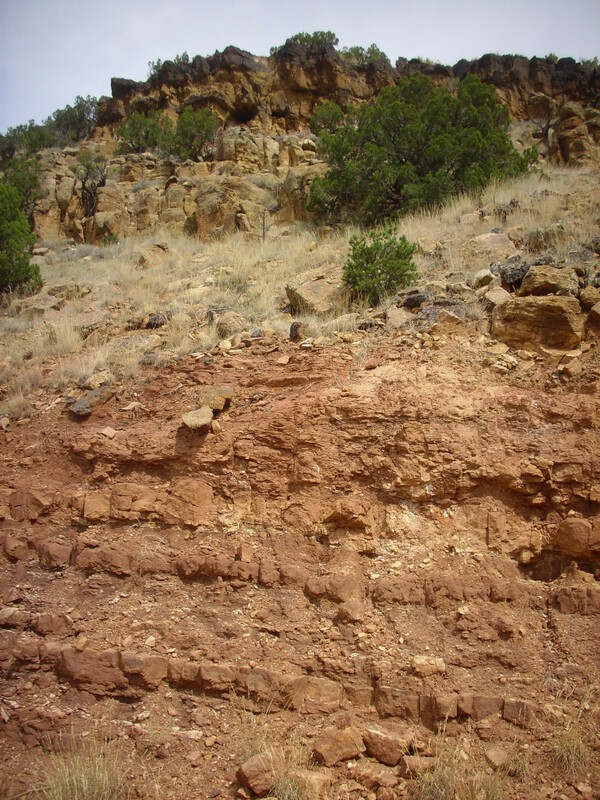 The lower red slopes are all Abo Formation; the thin bed in the notch between talus fans, near the center of the picture, is La Cueva Member. You can see the contact with the very thick, featureless cliff of Otowi Member above. The beds at the top of the mesa are Tshirege Member. 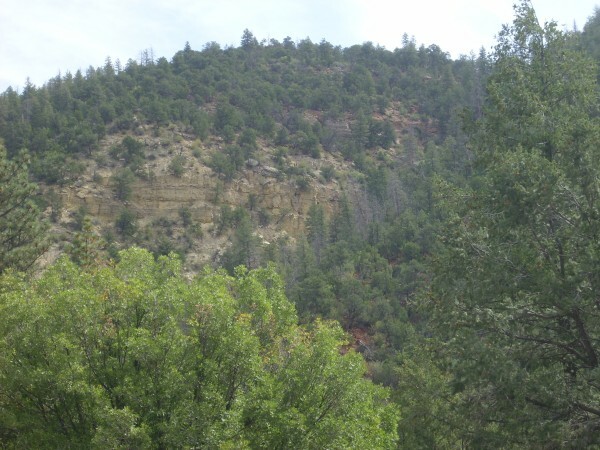 I am somewhat tempted to come back and climb up to the notch, but it looks like the only bridge across the Jemez River here may be a private bridge. Shucks. From there to home, by 3:00. I had written down 2:00 to 4:00 on my flight plan, so that wasn’t bad. And, for some reason, Monkey Cat has fallen in love with my rock samples. 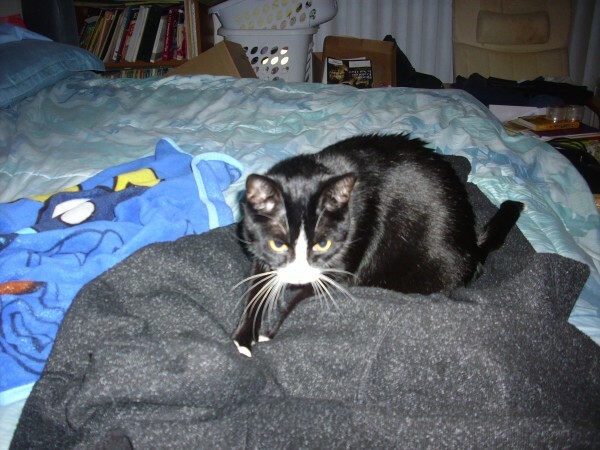 She came and rolled in them after I pulled them out of my pack — no joke. Go figure.